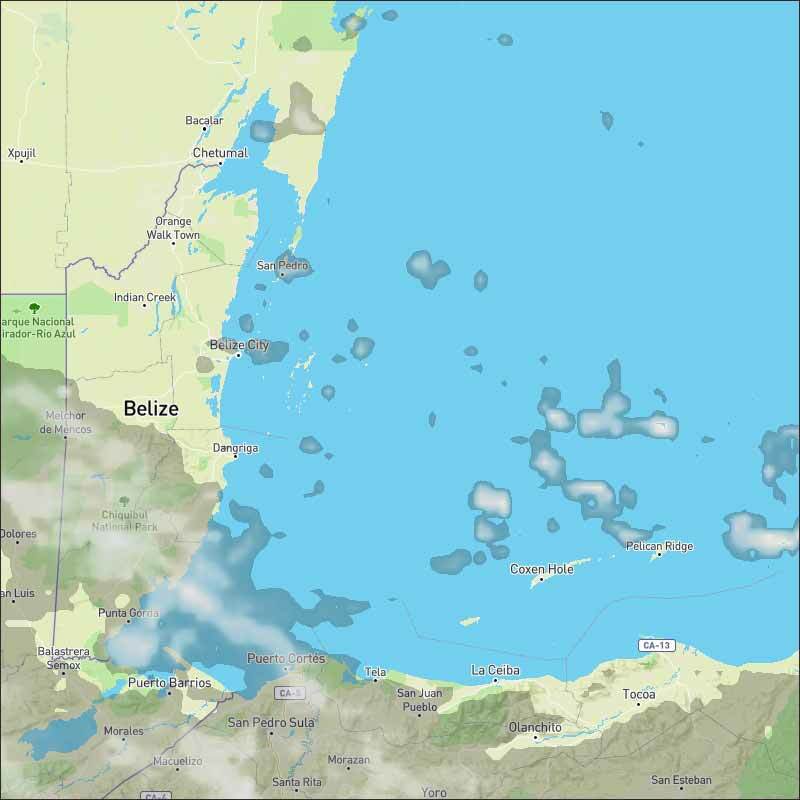 Belize NMS: A light northeasterly airflow will prevail over the area. 24-hour forecast: Mostly sunny today and partly cloudy tonight. A few showers and possible isolated thunderstorms will occur over the south and sea this morning and then mainly over inland areas this afternoon. Otherwise, showers will be isolated. General Outlook: For Monday and Monday night is for generally fair weather to prevail, with a few showers and possible isolated thunderstorms over the sea during the morning and night again, and over inland areas during the afternoon. Today NE 5-10 kts Slight-Light Chop 1-3 ft A FEW SHOWERS AND POSSIBLE ISOLATED THUNDERSTORMS. Tonight NE-E 5-10 kts Slight-Light Chop 1-3 ft A FEW SHOWERS OR ISOLATED THUNDERSTORMS MAINLY OVER THE EXTREME SOUTH. Tomorrow NE 5-10 kts Slight-Light Chop 1-3 ft A FEW SHOWERS AND POSSIBLE ISOLATED THUNDERSTORMS, DECREASING. Outlook E-NE 5-10 kts Slight-Light Chop 1-3 ft MONDAY NIGHT:- A FEW SHOWERS AND POSSIBLE ISOLATED THUNDERSTORMS. Two tropical waves are moving across the basin. See the Tropical Waves section above for details. The eastern extent of the E Pacific monsoon trough extends over the Costa Rica and Panama along 09N producing isolated moderate convection over the SW Caribbean S of 13N. Recent scatterometer data indicate gentle to moderate trades prevail across most of the basin except in the vicinity of the tropical wave across the eastern Caribbean. Fresh winds prevail mainly east of 66W. Large northerly swell associated with Leslie will affect the tropical Atlantic waters tonight through Sunday, building seas to 10-11 ft. In the upper levels, an upper level low is centered N of E Cuba near 22N76W. 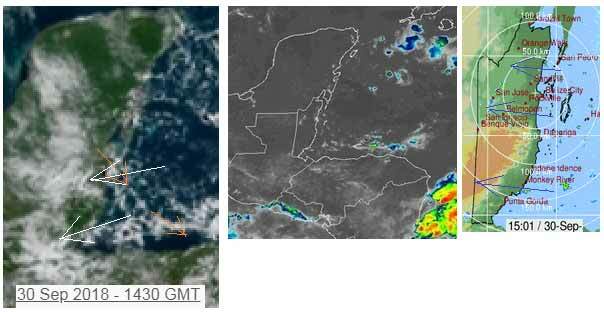 This low is producing scattered moderate convection S of Cuba from 20N-21N between 77W-80W. On Ambergris Caye this Sunday morning the sea around our barrier reef is flat calm with a hint of a breeze from The Northeast. 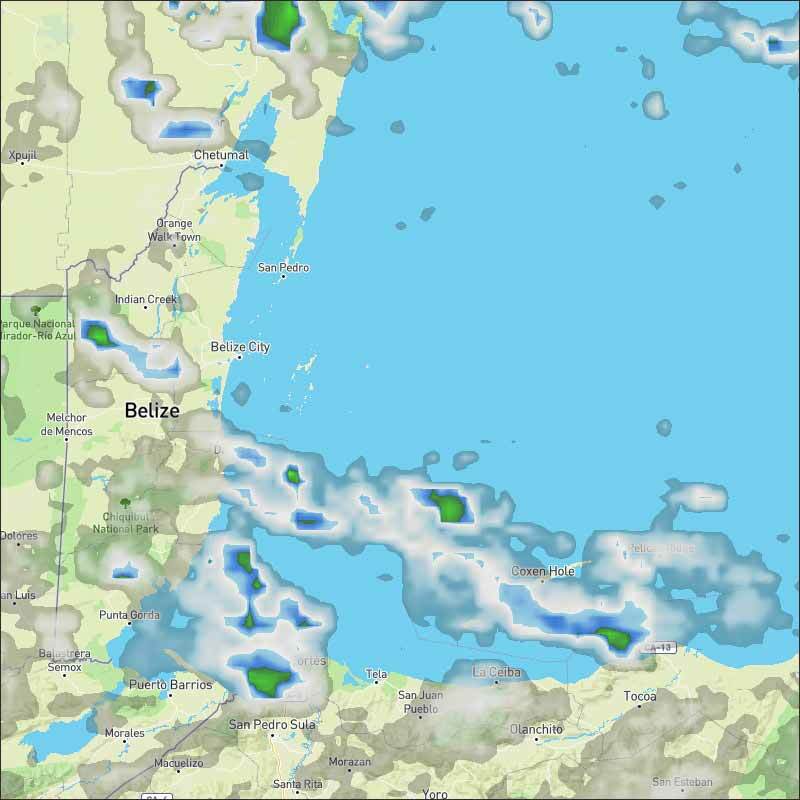 The expected high temperature today is 88 f.
Easterly chunky patches of Caribbean cloud coming in causing a few small isolated rain showers, in any place. Yet only a trace of high level cloud from the NW. Looks like today will have patches, areas of heavy cloud, sunshine and the risk of the odd rain shower. The Cloud and rain picture. The chunky Caribbean clouds are causing rain pockets in many places, some of it heavy, but they are isolated. Monthly weather summaries are prepared by the climate section of the National Meteorological Service of Belize. The NMS of Belize maintains a network of over 25 weather stations that are situated primarily in the agricultural regions of the country. Temperature and rainfall are read at 9 am each morning and the rainfall total read at this time represents the accumulated rainfall for the previous day. 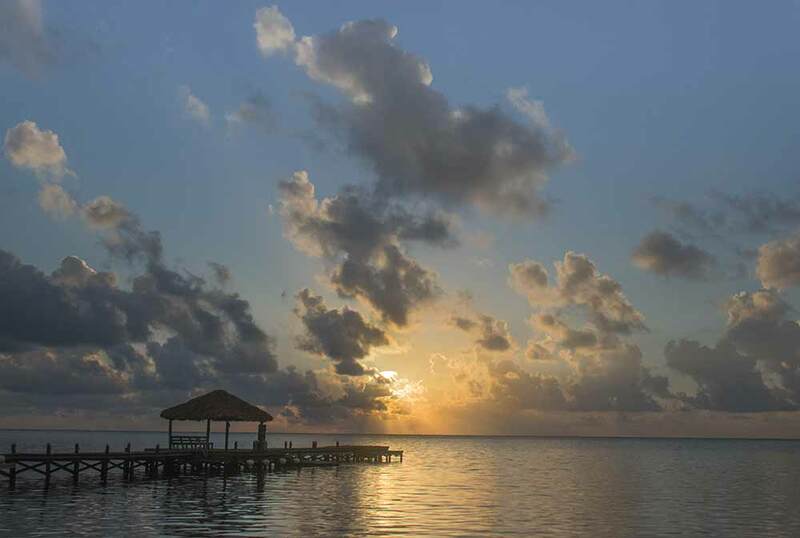 September is typically a wet month for the country of Belize. It also coincides with the peak of the Atlantic Basin Hurricane Season and a significant amount of the historical tropical cyclones that have affected the country occurred during the month of September. Apart from tropical cyclones, other systems that typically affect Belize during the month of September include tropical waves, Tropical Upper Troposheric Troughs (TUTTs) and at times cold fronts and frontal shear lines affect the country as early as September. September 2018 was drier than normal for most of the country, except the extreme west-central areas and the south. The month started off generally fair with showers and isolated thunderstorms confined to the Maya Mountains. Moisture increased slightly on the 2nd with the approach of a tropical wave. The wave crossed early on the 3rd and moisture in its wake supported a few showers and isolated thunderstorms. Conditions continued relatively moist during the night of the 3rd through early morning on the 4th with moisture decreasing thereafter. Conditions were relatively dry from the 5th to the 7th. A slack pressure pattern over the area supported light easterly winds and subsequently warm conditions, especially in the interior. The result was mainly fair weather with isolated showers and thunderstorms inland during the afternoon due to daytime heating. Weak tropical waves crossed the country overnight between the 5th and 6th and again on the 7th but they did not have significant upper level support to produce organized convection over the area. 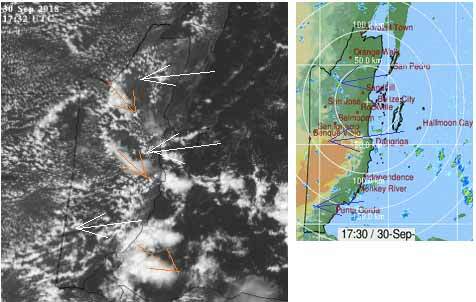 Moisture started to increase over the area on the 8th and this was associated mostly with a TUTT. By the 9th this system was supporting an induced trof across the northwest Caribbean Sea. This supported a relatively moist easterly flow over the area and resulted in a few showers and isolated thunderstorms mainly over northern and central areas. The National Hurricane Center (NHC) analyzed this system as a tropical wave which they had passing the country at around 18Z (12 midday) on the 9th. However, by the 10th they had the induced trof over the northwest Caribbean just north of northeastern Honduras. Moisture increased further on the 10th when an imbedded 1009mb low pressure system was analyzed along the axis of the trof. Showers and thunderstorms continued affecting mainly northern and inland areas. By the 11th the axis of the trof moved north to northern Yucatan but a very moist pattern continued in its wake. Subsequently showers and thunderstorms persisted over the country through to the 12th. A relatively dry pattern became established across the country from the 13th through to the 18th of September 2018. This period was characterized by a slack pressure pattern and light winds over the area. Meanwhile at the upper levels a neutral to weakly convergent pattern prevailed inhibiting organized deep convective activity over the area. Showers and thunderstorms were generally isolated with occasionally a few more affecting southern areas. Moisture increased on the 19th with the approach of a surface trof linked to the remnants of tropical storm Isaac over the area. This feature crossed the country slowly that day supporting an increase in cloudiness, showers and thunderstorms. Moisture continued relatively high the following day with showers and thunderstorms persisting especially over southern and inland areas. A further increase in moisture was noted on the 21st and 22nd. This was associated with the slow approach of a tropical wave combined with increasing divergence at the upper levels. This resulted in a steady increase in showers and thunderstorms across the country. The tropical wave crossed overnight between the 22nd and 23rd and upper divergence peaked over the area between the 23rd and 24th. The upper system was a TUTT with axis west of the area supporting the divergent southwesterly flow aloft. As a result wet conditions persisted over the country. Weather conditions continued relatively moist during the final week of September 2018 even though no tropical wave crossed until the 29th. A relatively moist easterly to east-northeasterly flow dominated. Additionally, the upper levels were generally divergent during this period and this provided the support for some convective activity over the area. This resulted a in a few showers and thunderstorms across the country for the remainder of the month. In summary, although the month of September 2018 saw many wet days, these wet days were not intense enough to produce normal or above normal rainfall for most of the country. 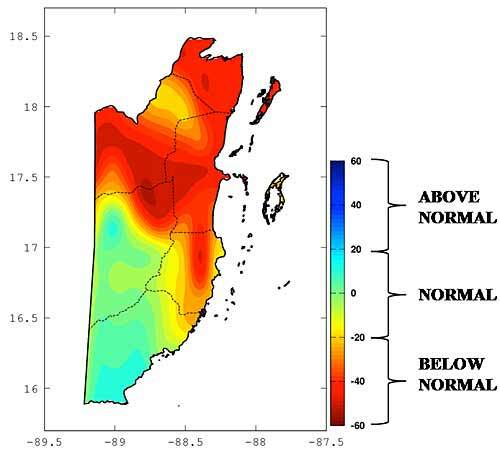 On the contrary, most areas of the country experienced below normal rainfall except over west-central and southern areas where rainfall was normal to slightly above normal. 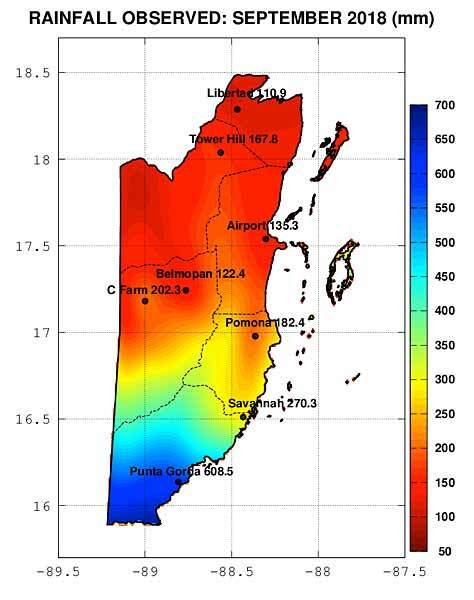 The graph and maps below summarize the total rainfall and average maximum and minimum temperature recorded during the month of September 2018. They also give an indication of how these readings compare to the normal for the month across the stations sampled. As can be seen, rainfall was below normal for most of the country, except for southwestern Cayo district and the Toledo district. In terms of maximum temperatures, four of the stations sampled here saw above normal maximum temperature in September 2018 while one was normal and the other four were slightly below normal. Meanwhile minimum/nighttime temperatures were more or less normal for most of the stations except Punta Gorda where the minimum was significantly lower than usual.